Behind the facade of Calgary’s inner-city neighbourhoods is a largely dusty area of garbage cans, bottle pickers and garages. It’s the perfect place to build a home. While there’s been a lot of rhetoric as of late around suburban versus urban growth, there’s a wealth of unused land in Calgary. In other cities that same land is being gobbled it up in the name of higher density while still maintaining the character of their neighbourhoods. You may initially scoff at the idea, but living in an alley is more appealing than you think. Matthew Kennedy has spent a lot of time thinking about alleys and community, specifically in Calgary. He wrote his masters of architecture thesis on the subject and is keen on pursuing the idea in the real world through his work at Studio North, along with partner Mark Erickson. Both men say it’s a good middle ground for those who want to live urban but have their own space with a yard. It also has the potential to make inner-city living more affordable, not only for those living in the laneway house, but also for those living in the larger, original home. “Maybe it doesn’t make it easier for a family that makes $35,000 a year, but what I think it will do is free up the rental market where people who make more money, who can afford $1,200 a month in rent, can live in a laneway house,” says Kennedy in reference to Calgary’s dismal rental situation and rising costs. 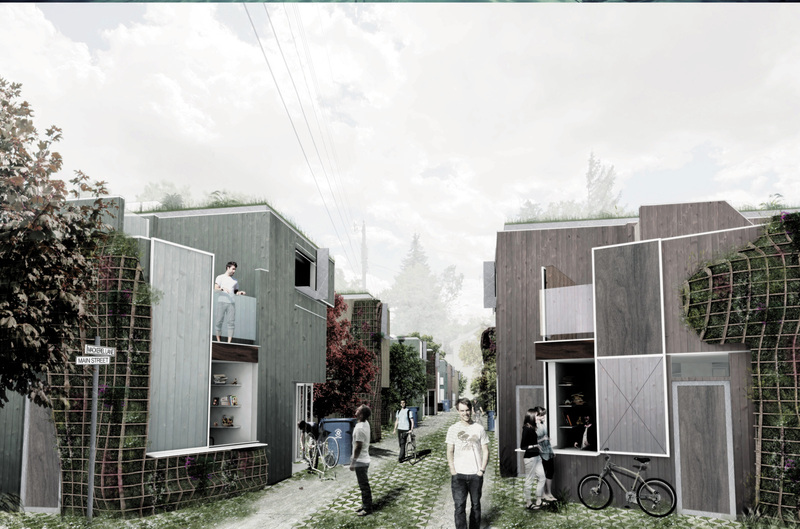 Of course, this isn’t a new concept — laneway housing has existed for a long time in many cities around the world. In our densest neighbour, Vancouver, it’s an increasingly popular planning option. Since 2009, that city has seen over 800 permits issued for laneway housing in single-family neighbourhoods, with 500 already built. In Calgary, where there’s a palpable fear of rental properties in many communities, and where the words “secondary suite” send some screaming for cover, this concept hasn’t really taken off and certainly faces a battle from NIMBY neighbours. It’s the reliance on relaxed zoning regulations, rather than drawing up a master plan, that most appeals to the Studio North partners. Though they have designed concepts for what laneways could look like, including tree canopies and informal courtyards between houses, their ideas tend to the anarchic rather than the prescriptive. For both Kennedy and Erickson, great cities develop in a piecemeal fashion, adding layers and mixing demographics to create a more interesting whole. What also appeals to them about the concept is the need for smart design, not only of the dwelling proper, but also it’s more confined interior — space at a premium is space that needs to be well thought out. “Or not used at all,” adds Kennedy.